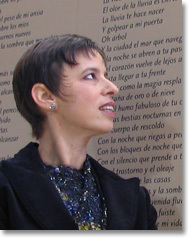 Beatriz Hausner is a Toronto poet and translator. She has translated many of the poets of Spanish American surrealism, including Rosamel del Valle, César Moro, Enrique Molina, Jorge Cáceres, among others. Hausner’s recent publications include her poetry collection The Wardrobe Mistress and a translation of Alvaro Mutis’ early fiction entitled The Mansion. Hausner was one of the founders of the Banff International Literary Translation Centre.